Confectionery brand launched an anti-advertising advertising musical on Super Bowl Sunday. 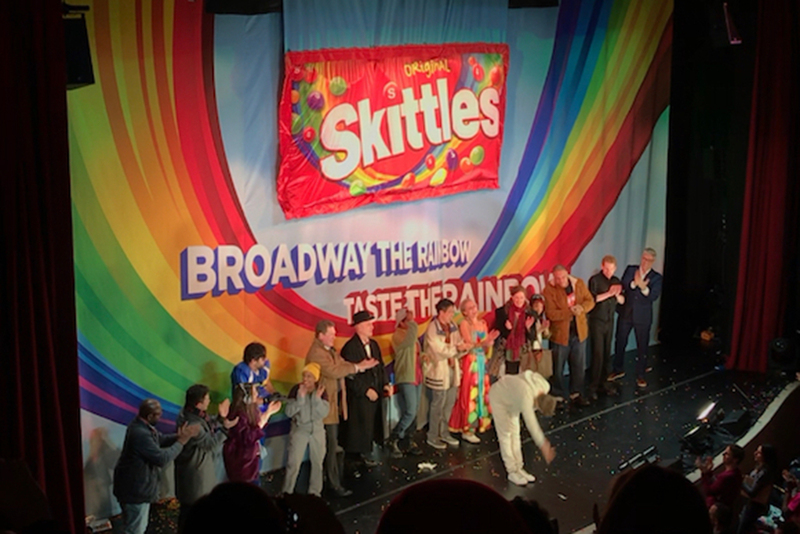 Not to brag, but I was one of 1,200 lucky people who got to see a one-time-only, live and sold-out performance of "Skittles commercial: the broadway musical" at The Town Hall in New York City on Sunday. Because no-one will get to see this again, I’ll give you the general premise: Michael C Hall enters a bodega and starts talking to the people in the shop about how he is going to be in a Broadway musical for Skittles. He seems to be grappling with his feelings about it and whether it might destroy his career and Broadway’s reputation. The script then takes a bizarre, Twilight Zone-like turn where people in the audience – aka actors – interrupt the show to ask him what’s going on and how this is even a commercial. He explains to those same audience members that they are actors and everything they are saying has been written by Skittles’ marketing team. Then they smash up the set in anger and an ATM machine falls on Hall, killing him. He reappears as a ghost and meets Winston Churchill and Amelia Earhart. When it seems all hope is lost, the cast returns to find that "almost 600" packs of Skittles were sold at the Broadway show. All rejoice. Hall is still dead. Journalists – and really all attendees – were genuinely excited to be there. A couple of young journos were behind me and, as we waited for the show to begin, they giddily kept repeating: "I am so happy to be here." The show was self-aware. It wasn’t possible for a negative thought about Hall, Skittles or advertising in general to enter attendees’ minds. The self-deprecating humour throughout took care of any of that. Skittles and the actors knew exactly what they were doing. The musical numbers alone trolled the marketing world, with titles such as Advertising Ruins Everything. Hall repeatedly questioned why he agreed to do such a commercial: "This Skittles Broadway thing could end my whole career." It was memorable. Anyone who saw this show will remember it for a long time to come, with its shocking twists and turns. 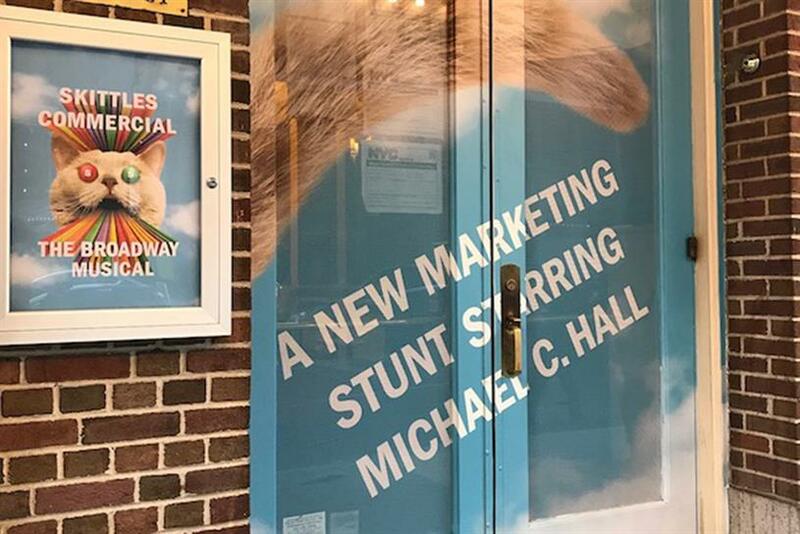 Some highlights: Hall dressed as a cat; cast members arguing with the audience; a fake ending minutes into the show; a line about Skittles being made of cat hair and sand; and, of course, Hall’s death at the end. Talkability and shareability factor. Because it was so bizarre, people will talk about it and write about it (sample A: PRWeek). And while no photos or videos were allowed during the actual show, attendees were invited onstage beforehand to check out the set and buy Skittles from the actor who plays the bodega owner in the show. People were sharing their experience on social with the hashtags #SkittlesTheMusical and #AdvertisingRuinsEverything. I would happily pay money to see more brands put on musicals. This is the first time a brand has done anything like this and I sincerely hope it is not the last. The idea alone was hilarious, but the show could have been a major flop. And the pressure was on, with some attendees paying $200 per ticket. I am no snob when it comes to Broadway, but I’ve been going since I was a child and I know a bad show when I see one. Sure, the script, songs and choreography were all over the top and corny, but it all worked and lived up to the hype. It wasn’t just weird for the sake of being weird. It was infused with genuine wit and creativity. It met Skittles’ goals. Mars Wrigley's vice-president of corporate affairs, Lee Andrews, told PRWeek that when planning for Skittles’ Super Bowl advertising, he looks at how he can get the brand noticed and talked about, and what the brand can do to surprise fans. "It’s all about doing something that is not predictable," Andrews said. "If I had a dollar for everyone that has asked me if we are really putting on a Broadway show for Skittles, I would be able to afford another TV spot at the Super Bowl."